Throughout any hiring process, employers want to gather as much relevant information on their candidates as possible. The problem is that traditional methods of getting to know candidates — resumes and interviews — often don’t yield the best insight. Research indicates that up to 78% of resumes contain misleading statements, while 46% contain actual lies. Similarly, interviews — especially unstructured ones — are subjective and ultimately serve as poor predictors of job performance. Why use Survey Anyplace to organize an employment test? Find out straight away whether or not the candidate is suitable and provide them with useful feedback regarding needed training and development. Employment tests provide a uniform basis for comparing the performance of applicants. The same tests are given to the candidates and their score will enable selectors to see their performance. Employment tests are less likely to differ in results by gender and race than traditional interviews. The aptitude and adjustability of candidates are determined with the help of tests. This enables their placement on the most suitable jobs. It will also improve their job satisfaction and efficiency. Job-knowledge tests are particularly useful when applicants have certain knowledge that can only be acquired through training or experience. Job-knowledge tests are commonly used in fields such as computer programming, law, and financial management. Cognitive tests can assess general intelligence and correlate highly with overall job performance. People with higher levels of cognitive ability tend to perform better. This is especially true for jobs that are particularly intellectually demanding. 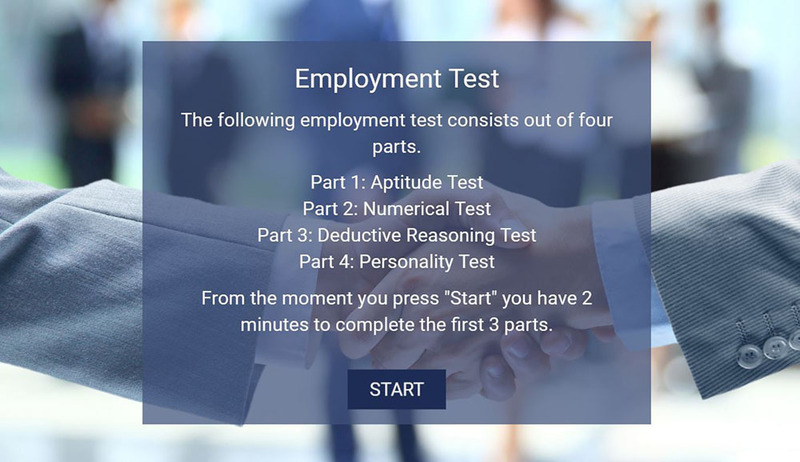 Situational judgment tests are used as employee-selection and employee-screening tools and have been developed to predict employment success. These tests present hypothetical scenarios in a multiple-choice format. Applicants are asked what they would do in a difficult job-related situation. Situational judgment tests measure the suitability of job applicants by assessing problem-solving, service orientation, and striving for achievement. Personality tests may potentially be useful in personnel selection. However, personality can also correlate with other aspects aside of job performance, such as leadership and effectiveness in a team environment. Performance-based assessment tests help find out if someone can do the job for which they are applying. It is done through tests, which are often administered by HR or Hiring Managers. Performance assessments can be used as a pre-screening tool to test applied knowledge and skills-job match. Physical tests. Some jobs require a certain amount of physical ability. Before hiring a person for these types of positions, an employer may administer a physical assessment to determine if the applicant meets minimum physical requirements. Law enforcement and emergency service positions are examples where physical agility testing is useful to ensure applicants can meet the physical demands. Learn more about Survey Anyplace’s Test Maker Functionalities. Looking for more test templates and examples? My experience has been excellent. The application is easy to use and produces quality surveys and tests. They are very responsive to any questions I have ever had.